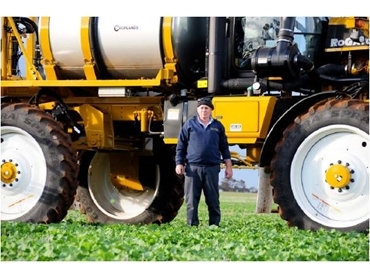 North West Victorian contract sprayer Haydn Bailey, owner and manager of contract spraying operation - Bailey Ag, believes his Croplands Equipment self propelled Rogator is the ideal crop sprayer when it comes to reliability and productivity maximisation. Now onto his third Rogator crop sprayer, the 1386 unit, Hadyn Bailey has previously owned a 1254 and 1286 Rogator, on which he notched up a collective total of 7,000 hours before selling them on. A former farmer, Bailey now earns a living as a full-time contract sprayer working within a 50km of Woomelang. His latest 1386 Rogator crop sprayer, purchased in October 2010, has already completed 800 hours and 70,000 acres work, an average of 60/ha/hour all day, including fill time. Bailey went from a 1286 Rogator crop sprayer supplied with 4,800L tank and 30m wide booms to his current 1386 crop sprayer, which is equipped with a 6000L tank matched to a 36m boom. This new configuration is ideal for the district’s 12m farming systems. Bailey's preferred general purpose nozzles, AirMix 02s, deliver a coarse droplet size with alternatives used for different spray applications. One of Croplands Equipment's biggest crop sprayers, the 1386 Rogator crop sprayer comes equipped with a 311 hp Caterpillar engine with weight distributed equally between the front and rear wheels to deliver unmatched performance in tough field conditions. Designed to be more reliable over the long haul, the Rogator drive system features separate hydraulic motors and gear hubs that run 'cleaner', thereby extending the life of hydrostatic components. Bailey is impressed by many of the his new Rogator crop sprayers features, including its new, wider tyres. “We’ve just been through a very wet summer spraying season with many self-propelled machines getting bogged but the 1386’s wider tyres carried the weight a lot better," he says. Bailey carries out much of its work across undulating Mallee country, which allows the 1386 Rogator crop sprayer to work at speeds of up to 33kph courtesy of the unit's air-bag suspension system, an air seat and, also an air suspended cab. Bailey also promotes the 1386 Rogator crop sprayer as having "the best cab in its class”, a wide door entry and panoramic view. “It’s got the best vision of any self propelled crop sprayer when the boom is folded, which is important for travelling down highways, even more so when exiting paddocks,” says Bailey. “You can see over the top of the boom, instead of looking through the boom, when it’s sitting on its support rests,” he adds. Bailey says work rates are between 15 to 20 percent higher compared to his previous crop sprayer, a figure influenced by the 1386 Rogator crop sprayer's bigger tank and wider boom. With six months under his belt with the new 1386, Bailey believes he will have notched up 2,000 hours work within 18 months. Bailey is one of many owners of Croplands Equipments’ burgeoning self propelled crop sprayer fleet around the Swan Hill district. He chose to purchase his third Croplands Equipment Rogator crop sprayer based on the brand's proven strength, reliability and familiarity.